Samsung Galaxy S Duos S7562 - Gadgets Info. To bring this robust and powerful phone to life is the 4-inch TFT capacitive touchscreen that supports WVGA, 480 x 800 pixel resolution with 16 M colours. With the Adreno 200 GPU you can enjoy smooth, rich and enhanced graphics. A phone wouldn’t be complete without an impressive camera but the Galaxy S Duos S7562 comes with not one, but two cameras. The phone has a 5 megapixel primary camera with 2x digital zoom and a 0.3 megapixel secondary camera. Features like auto focus, panorama and photo effects make photography fun. You can shoot videos at 30 fps and relive memorable moments in vivid colour. 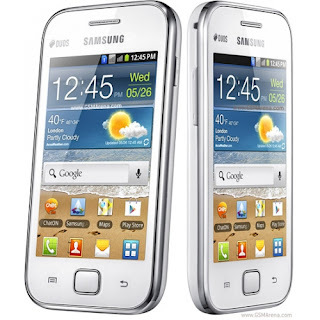 To give you even more entertainment the Samsung Galaxy S Duos has an FM radio, video player and music player. There is no denying that the slim design of the bar shaped S Duos grabs attention immediately. The smooth finish and compact design makes it quite appealing. The phone neatly packs a 3.5 mm audio jack and a micro USB port into its design. To give you the best view when you switch between applications the phone is equipped with sensors like the accelerometer, proximity sensor and compass. The Android Galaxy S Duos has 4 GB internal memory and the memory can be expanded up to 32 GB using micro SD and micro SDHC cards. A 1500 mAh Li-Ion battery powers the phone and supports up to 12 hours of talktime on the 2G network and up to 8 hours on 3G. The phone supports up to 570 hours standby time on 2G and up to 470 hours on 3G. The phone is equipped with GPRS, EDGE, Wi-Fi and Wi-Fi Hotspot for uninterrupted internet connectivity. TheChatON feature allows you to chat, group chat, share multimedia content and even create personalized animated messages. The S Duos has Bluetooth that facilitates unlimited transfer of music, videos and data files to other compatible devices. The A-GPS enabled S Duos comes with useful features and apps like Google Maps, Document Viewer, Pushmail and Google Search to make this phone the perfect device to carry when you travel and to make every day fun.